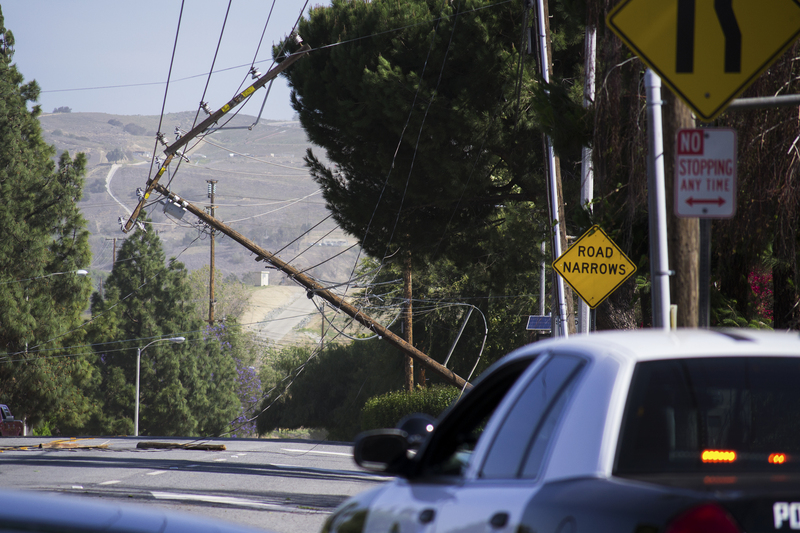 A downed power line leans over Rose Drive in Yorba Linda on Tuesday morning, April 29, 2014. High wind downed a power line on Rose Drive just north of Wabash Avenue in Yorba Linda on Tuesday morning, causing a power outage in surrounding neighborhoods like the Lake Park community. The power line was leaning out at about a 45-degree angle out into the street, which was closed down, Tuesday morning. According to Yorba Linda resident Gene Palmer, who lives in a surrounding neighborhood, his house lost power around 8 a.m.
Palmer said that particular stretch of the power line, which is just south of Carbon Canyon, has been leaning for a while and has worsened since last month’s earthquake. Electricians from Southern California Edison were assessing the damage Tuesday morning. Story and photos by Tim Worden. Updated at 11:45 a.m. on April 29, 2014. A Sheriff’s officer talks to residents who were affected by the power outage. Rose Drive was closed Tuesday morning. View of the downed power line.